When I tell people I pick quinces locally, they ask where. I smirk enigmatically and say, ‘I know a tree.’ Then I change the subject. For you, I’ll say a little more. The tree in question surprised me last fall when I was driving down a busy highway. I spotted it near the entrance to an abandoned restaurant. And my heart started racing the way it does for some women when they see charcoal grey Manolo Blahniks at 1/3 off retail. 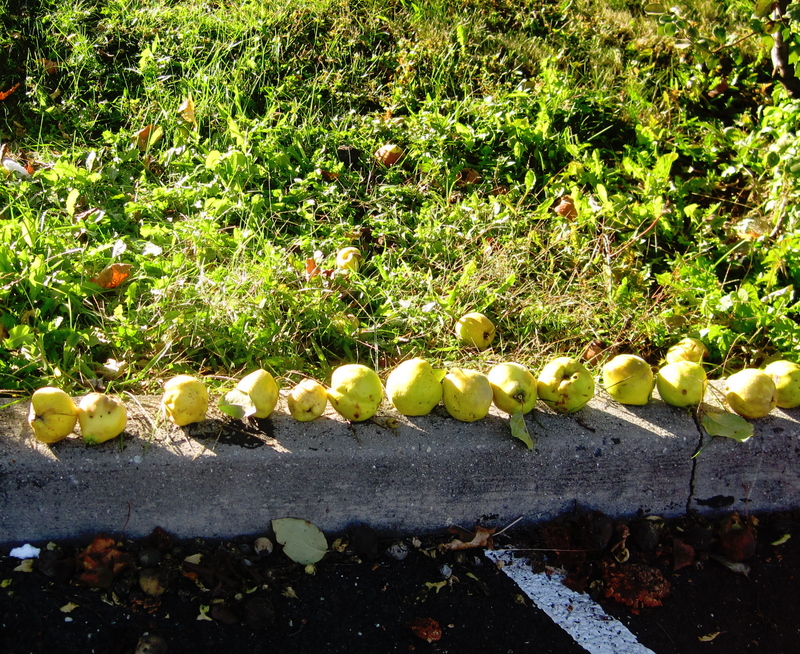 Golden green fruit was hanging from the tree, so I figured it was either Golden Delicious apples or quinces. I went back not long after with my stepladder. Even while I was picking them I still wasn’t sure what they were. But once I had them in the car I knew. Quinces have the loveliest fragrance—like their cousin the apple, but sexier. There was no longer any doubt what I’d found. This year I brought a bigger stepladder. It was my birthday. I had my long hair down, which I don’t recommend, because when you climb up into the branches your hair will get caught in eleventy-hundred directions, and you’ll have to pry it loose, and afterward go to Trader Joe’s looking like Annie Oakley after the second week of deer camp, not that I’d know anything about that. I picked maybe six pounds of fruit and took these shots in the early evening light. After people ask me where I find what I find, they often follow up with, ‘I drive down that road all the time and have never seen it. How did you?’ I’m not brighter or more skilled at finding wild edibles than anyone else. The shortest answer is that I’m looking. Consciously or unconsciously, you have to be looking. It has matter to you. And it’s the same case with the people at the car wash. They didn’t see me because they weren’t looking. I picked in peace…just the way I like. Happy golden green birthday to me. BTW, I’ve never tasted a quince. Yes, really. Hiya Trina–thanks! 🙂 Those guys will rule forever. And don’t feel badly; if anything, people have had something called quince paste, which is more like jelly. But actual quince, say, poached in a cinnamon simple syrup, the way I like it? A massive rarity! Interesting. I thought maybe you ate the fruit raw and whole like an apple and wondered how I’d missed it. Anything with cinnamon sounds yummy to me. Do you make it as a spread or a filling? 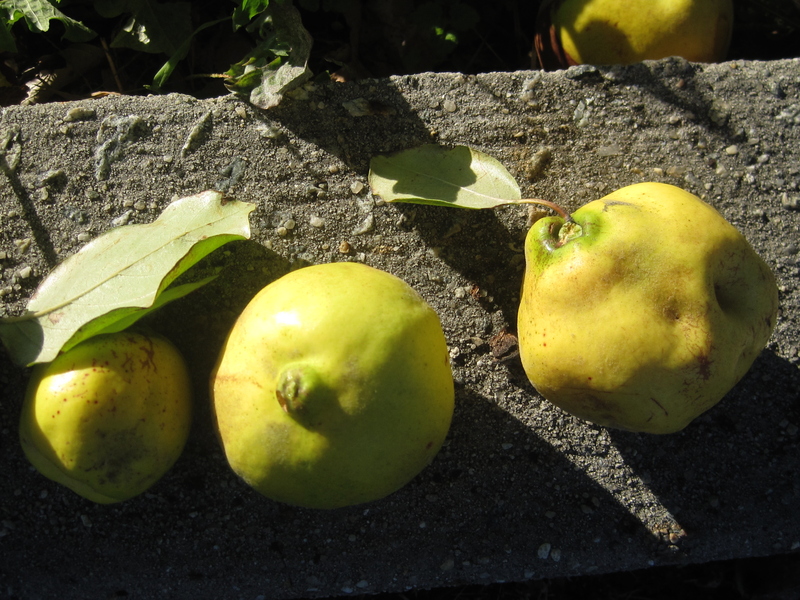 Quinces are not like their cousins in that they cannot be eaten raw; they’re pretty tough. But when poached they become tender and lovely. I like them best sitting in their syrup in a bowl, hot or cold. They’d also be a great topping for just about anything, and make a good pie. Maybe I’ll talk more about this when I cook these up. Now I so want to try them. I will watch for them in the stores here. I really miss NYC when it comes to food. (And a host of other things.) Looking forward to reading about your quince adventures. What you described — about eating them poached in a bowl — makes me think more of pears (than the quince cousin, the apple). Keeping one’s eyes open is important in your life and mine. As an antique shop owner I have taught myself to look deeply and to really see. And, it is so enjoyable to see the subtle colors in a November day, the individual history and beauty of an item rather than looking for only what is trendy (although I do that, too) and even the pattern in the brickwork of an old building. Such beauty and interest everywhere. Hi Ginene! You’re so right, and what a lucky lady you are to own an antiques shop! (As a prop master for theatre I spend many hours at my local shops, and enjoy every minute there.) It’s true that there is beauty all around; we just have to look. Welcome aboard eve’s apple! I’ve been lucky enough to sell a few pieces to theater companies. My sister and I laugh about a 1930s dining room buffet that we sledded down a hill to my truck from a farm house sale and that ended up on stage in at the National Theater in London for the production of August: Osage County. Actually, I would rather have your job! What a GREAT story! You must have laughed all the way down that hill. I’ll remember that one, and tell it again 🙂 My job’s part-time; would that it was full-time. Maybe someday!